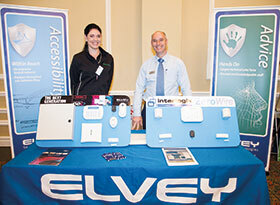 Elvey cemented its involvement and presence in the residential estate market at this year’s Hi-Tech Security Solutions’ Residential Estate Security Conference held in August 2017. Not only did the company have a stand at the event, but Pentagon, Elvey’s integrated systems design and supply business (a subsidiary of the Hudaco Group), reinforced the company’s residential estate offerings with a presentation on a variety of cameras suitable for the sector. Max de Sousa discussed key technical considerations estates should make when designing and implementing perimeter CCTV systems. She focused on four main categories – camera technology; network technology; redundancy; and the planning of power. De Sousa weighed up the advantages and disadvantages of optical versus thermal imaging camera technology. With regard to network technology and redundancy, she pointed out that, generally, the large distances as well as other factors on estates have a negative influence on network reliability. She cites the example of fibre optic cables running to surveillance cameras. When a garden service, for instance, is busy digging in the grounds, they could possibly damage the fibre. By using an intelligent technology like Turbo Ring, which is a self-healing cable that automatically seeks out an alternative viable route, any communications problems are eliminated. De Sousa says that many estates are victim to power spikes and surges via Eskom, interference from electric fences and lightning. The solution is to be able to ensure that power is clean, which results in interference and damage being minimised. She also touched on the use of video analytics to provide accurate detection of the type of intrusion experienced. By knowing whether the presence is human or animal, the necessary actions can be taken. Highlighted technology from Elvey’s intruder detection range included alarm systems with various detectors for any type of application. Pentagon’s thermal imaging, Bosch Starlight low-light cameras and Bosch VOT cameras were augmented with the screening of relevant video clips and interactive presentations.